I guess some people are always going to look back - and I'm one of those people. Give me the hi-tech marvels of the world wide web and what do I do? I'm discovering entertainments that were popular before I was even born. 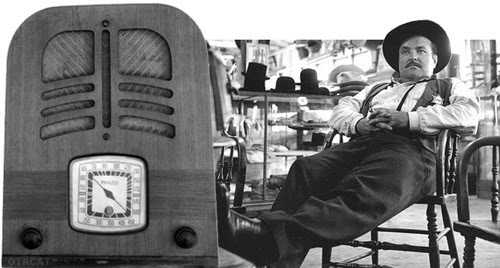 I've always enjoyed radio , listening to comedies and plays on BBC Radio Four but thanks to the Internet I can explore shows from a time when radio was the main form of entertainment for millions and Television was a medium yet to take over. Being a western fan it was natural for me to check out as many of the old radio western dramas as I could find, and believe me there are many, but out of them all Gunsmoke has become a firm favourite. I started off listening to shows on websites such as the excellent Old Time Radio Archive and from there started buying DVD's off ebay which contained MP3's of complete runs, where the episodes survive, of radio shows. The recordings are in the public domain and enterprising fans are able to make a little money by making their collections available to anyone interested. 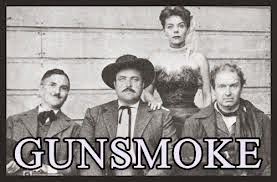 Gunsmoke of course made the transistion to televsion and I was familiar with some of the TV episodes but the radio show was first, and also featured a different actor in the lead role of Matt Dillon. William (Canon) Conrad was Marshall Matt Dillon for the entire run of the radio series, 1952-1961 and there are some great episodes in existence just waiting to be discovered or rediscovered by western fans and radio drama enthusiasts. I've got 400 plus episodes on both my hard drive and iPod and I'm pretty much addicted. I have embedded an entire episode above,in which Marshall Dillion meets up with an old flame. I selected this episode because it shows the loneliness of the US Marshall, effectively portrayed by William Conrad and a great supporting cast. Other episodes can be found online at the various Old Time Radio websites across the web or do an eBay search on old time radio. I recently bought 430 episodes for £2 - now that's incredible value. And once you've tried Gunsmoke I've no doubt you'll want to explore other radio westerns available - Six Shooter for instance stars James Stewart, while other shows feature a list of Hollywood luminaries as long as your arm. 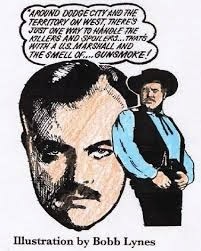 There are all sorts of radio westerns available - from the pulpy adventure of The Long Ranger, to the historically accurate shows like Gunsmoke and Hawk Durango. Check out this page HERE which features several episodes from a variety of shows.